It's not ideal, but WSU linebacker Peyton Pelluer is back for a sixth season after his redshirt senior year was cut short with a broken foot. Mike Leach is happy to have Pelluer's experience, and Pelluer is happy to continue a Cougar legacy that has spanned back to the 1920s. 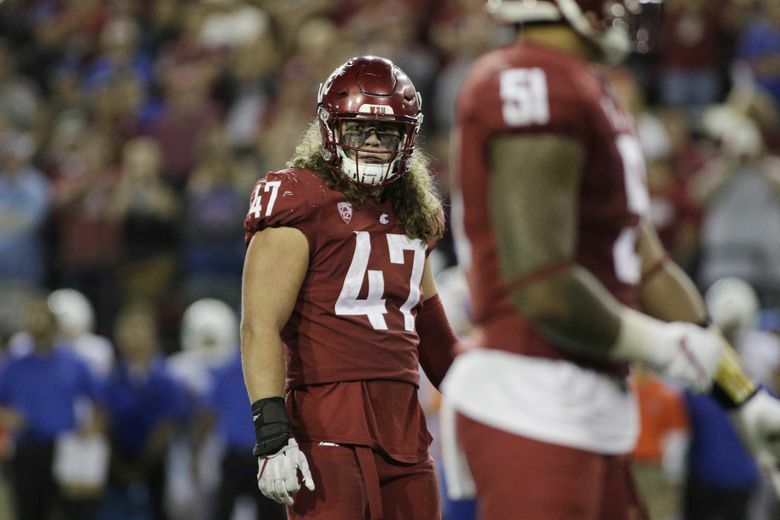 This was not how middle linebacker Peyton Pelluer envisioned his final season at Washington State. That was supposed to be last year, when he and 12 other fifth-year seniors could bask in the knowledge they had played huge roles in transforming the program, helping lead the team to three straight bowl games after 11 consecutive losing seasons. But in the third game of last season, during Washington State’s 52-23 victory over Oregon State, Pelluer broke his left foot. His season was over. But not his career. The former Skyline High School of Sammamish star applied for a sixth year of eligibility, and it was granted earlier this year. So if it isn’t the finale that Pelluer, the fourth generation in his family to play football for WSU, had envisioned, he’s certainly not complaining. Among the players WSU has to replace this season is fellow linebacker Isaac Dotson, who had roomed with Pelluer since they were freshmen. Pelluer also lost two more roommates who finished their college careers: Luke Falk, the Pac-12’s all-time leading passer, and Jamal Morrow, the team’s leading rusher. Washington State certainly could have used Pelluer at the end of last season when injuries contributed to the team going 3-4 in its final seven games after starting 6-0. But having him back this year is sure a bonus. Senior receiver Kyle Sweet was the only junior living with Pelluer and the three others last year. The two now share a place with senior defensive tackle Nick Begg. He and Pelluer are considered the leaders of the defense. But Pelluer brings something much more tangible to the defense. At 6 feet and 230 pounds, he is a tackling machine — just like father Scott was at WSU before playing five seasons in the NFL. Peyton Pelluer has 254 career tackles, finishing fifth in the Pac-12 as a sophomore with 101 and fourth as a junior with 93. A two-time honorable mention All-Pac-12 selection, Pelluer seemed headed to a huge season last year. He was Pac-12 defensive player of the week for his work in WSU’s come-from-behind win over Boise State in the second game of the season. His 14 tackles that game were a season high for the Cougars and he also returned an interception 36 yards for a touchdown. The next week, Pelluer was back in the news. He broke his foot against Oregon State. Because of that, everything changed. Not that it was easy. The fracture was at the bottom of his foot “and it was tough to heal.” For a month, he could not put any weight on his foot, and he used a scooter to help him get around. Pelluer said the injury made him more appreciative of playing football. Pelluer said it tugs at his heart when he thinks about his great-grandfather, Carl Gustafson, who was a flanker for WSU from 1925-27 and won the team’s Fred Bohler Award for being inspirational in a vote by the players. Grandfather Arnie Pelluer was an end for the Cougars from 1953-55, and father Scott won the Bohler Award in 1980 as a senior. But despite the long family history at WSU, uncle Steve was a quarterback at Washington who played in the NFL for eight seasons, and older brother Cooper played for the Huskies. Pelluer will have a new look during his extra season, with his hair now short after having it long the past few seasons (“I just had to do it”). But there are a lot of new things with the Cougars defense, including defensive coordinator Tracy Claeys, who took over for Alex Grinch, who left for Ohio State. Of course, the new guys can also lean on Pelluer. Pelluer, who wants to teach and coach when he is done playing, just wants to continue what he helped start at WSU: a winning tradition.